Krizhevsky's winning model is a convolutional neural network (convnet), which is a type of neural net that exploits spatial correlations in 2-d input. Convnets can have hundreds of thousands of neurons (activation units) and millions of connections between them, many more than could be learned effectively previously. 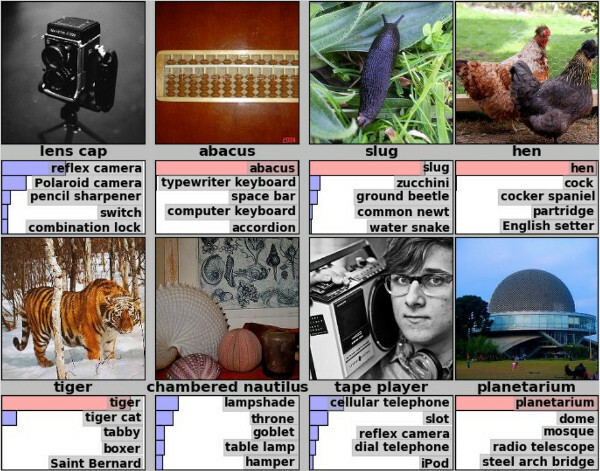 This is possible because convnets share weights between connections, and thus vastly reduce the number of parameters that need to be learned; they essentially learn a number of layers of convolution matrices that they apply to their input in order to find high-level, discriminative features. Many papers have since followed up on Krizhevsky's work and some were able to improve upon the original results. But while most attention went into the problem of using convnets to do image recognition, in this article I will describe how I was able to successfully apply convnets to a rather different domain, namely that of underwater bioacoustics, where sounds of different animal species are detected and classified. Figure 2: The Kaggle leaderboard after two days into the competition. The trick to my early success was that I framed the problem of finding the whale sound patterns as an image reconition problem, by turning the two-second sound clips each into spectrograms. Spectrograms are essentially 2-d arrays with amplitude as a function of time and frequency. This allowed me to use standard convnet architectures quite similar to those Krizhevsky had used when working with the CIFAR-10 image dataset. With one of few differences in architecture stemming from the fact that CIFAR-10 uses RGB images as input, while my spectrograms have one real number value per pixel, not unlike gray-scale images. 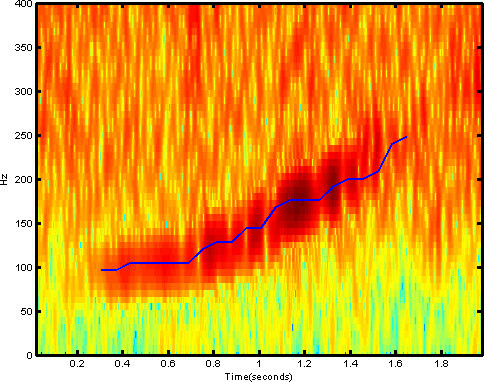 Figure 3: Spectrogram containing a right whale up-call. Spurred by my success, I registered for the International Workshop on Detection, Classification, Localization, and Density Estimation (DCLDE) of Marine Mammals using Passive Acoustics, in St Andrews. A world-wide community of scientists meets every two years at this workshop to discuss the latest developments in using passive acoustics (listening for sounds) to detect and track marine mammals. That there was such a breadth of research around this topic was entirely new to me, and it was fascinating to learn about it. Another thing that I've since learned is that this breadth is sadly dwarfed by the amounts of massive underwater noise that humans produce today, through shipping, oil exploration, and military sonar. And this noise severely affects the lives of animals for which "listening is as important as seeing is for humans – they communicate, locate food, and navigate using sound." The talk that I gave at the DCLDE 2013 workshop was well received. In it, I elaborated how my method relied on little to no problem-specific human engineering, and therefore could be easily adapted to detect and classify all sorts of marine mammal sounds, not just right whale up-calls. At DCLDE, the execution speed of detection algorithms was frequently quoted as being x times faster than real-time, with x often being a fairly low number around 1 to 10. My GPU-powered implementation turned out to be on the faster side here: on my workstation, it detects and classifies sounds 700x faster than real-time, which means it runs detections on one year of audio recordings in roughly twelve hours, using only a single NVIDIA GTX 580 graphics card. However, it should be mentioned that good datasets are a bit tricky to come by in this field. The nature of hydrophone recordings is that the signal you're listening for could be generated a few meters away, or many kilometers, and therefore be very faint. Plus, recordings often contain a lot of ambient noise coming from cargo ships, offshore drilling, hydrophone cable flutter, and the like. With the effect that often it's hard even for a human expert to tell if the particular sound they're listening to is a vocalization of the mammal they're looking for, or just noise. Thus, analysts will often label segments as unsure, and two analysts will sometimes even give conflicting labels to the same sound. Four NARW up-calls that are easy to detect. This leads to a situation where people tend to ignore noisy sounds altogether, since if you consider them, predictions become difficult to verify manually, and good training examples harder to collect. But more importantly, when you ignore sounds with a bad signal-to-noise ratio (SNR), your algorithms will have an easier time learning the right patterns, too, and they will make fewer mistakes. As it turns out, noise is often more of a problem for algorithms than it is for human specialists. The approach of ignoring sounds with a bad SNR seems fine until you're in a situation where you've put a lot of effort into collecting recordings, and then they turn out to be unusually noisy, and trying to adjust your model's detection threshold yields either way too many false positives detections, or too many calls are missed. One of the very nice people I met at DCLDE was Holger Klinck from Oregon State University. He wanted to try out my convnet with one of his lab's "very messy" recordings. Some material that his group at OSU had collected at five sites near Iceland and Greenland in 2007 and 2008 had unusually high levels of noise in them, and their detection algorithms had maybe worked less than optimal there. Figure 4: "Locations of passive acoustic moorings near Iceland and southern Greenland (black spots), and the number of right whale upcalls detected per day in late 2007 at the five sites." Taken from . Note the very low number of calls detected at the CE and SE sites. I was rather amazed when a few weeks later I had a hard disk from OSU in my hands containing in total many years of hydrophone recordings from two sites near Iceland and four locations on the Scotian Shelf. 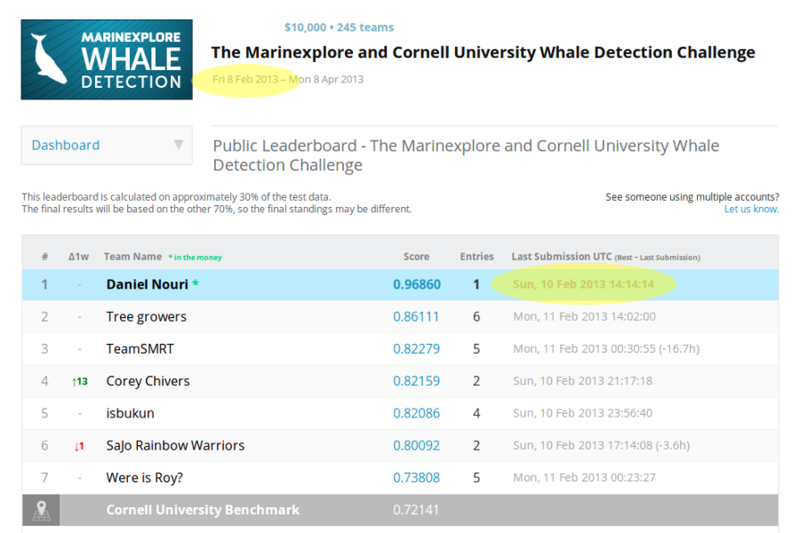 I dusted off the model that I had used for the Kaggle Whale Detection Challenge and quite confidently started running detections on the recordings. Which is when I was in for a surprise: the predictions my shiny 97% model made were all really lousy! Very many obvious non-whale noises were detected wrongly. How was it possible? To solve this puzzle, I had to understand that the Kaggle Whale Detection Challenge's train and test datasets had a strong selection bias in them. The tens of thousands of examples that I had used to train my model for the challenge were unrepresentative of all whale, and particularly, a lot of similar-sounding non-whale sounds out there. That's because the Kaggle challenge's examples were collected by use of a two-stage pipeline, where an automated detector would first pick out likely candidates from the recording, only after which a human analyst would label them with true or false. I realized that what we were building in the Kaggle challenge was a classifier that worked well only if it had a certain detector running in front of it that would take care of the initial pass of detection. My neural net had thus never seen during training anything like the sounds that it mistook for whale calls now. Many (quite enjoyable) hours of listening to underwater sounds later, I had collected some 2000 training examples this way, some of which were already pretty tricky to verify. And luckily, the newly trained model started to make pretty good predictions. When I sent my results back to Holger, he said that, yes, the patterns I'd found were very similar to those that his group had found for the Scotian Shelf sites! Figure 5: Number of right whale up-call detections per hour at two sites on the Scotian Shelf, detected by the convnet. The numbers and seasonal pattern match with what Mellinger et al. reported in . The OSU team had used a three-stage detection process to produce their numbers. Humans verified in phases two (broadly) and three (in more detail) the detections that the algorithm came up with in phase one. Whereas my detection results came straight out of the algorithm. A case-by-case comparison still needs to happen, but the similarities of the overall call patterns suggests that the convnet reaches comparable performance, but without the need for human analysts to be part of the detection pipeline, making it potentially much more time-efficient to use in practice. What's even more exciting is that the neural net was able to find right whale up-calls at the problematic SE site near Iceland, where previously no up-calls could be detected due to high noise levels. 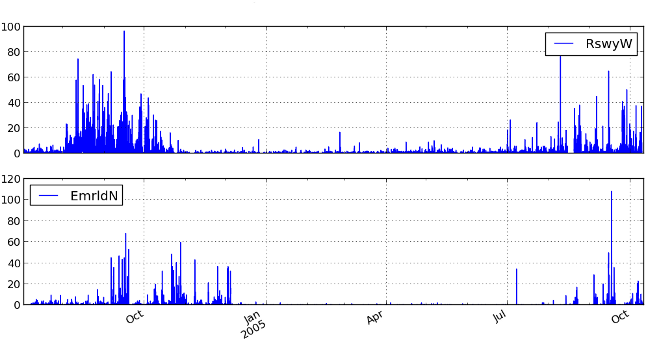 Figure 6: NRW up-call detections per day at sites SW and SE near Iceland, detected by the convnet. The patterns at the SW site match roughly with what was reported in , while no calls could be identified previously at the SE site (cf. Figure 4). Another thing we're currently looking into is wheter or not the relatively small but constant number of calls that the convnet detected during Winter season are real, or if they're false positives. Right whales are not known to hang around so high up North during that time of the year, so proving that would constitute significant news for people studying the migration routes of these whales. For a more detailed history and recent developments around neural nets, see this article in Nature: "Computer science: The learning machines". See the mention of my results in this Wired article: "Wanted: Right Whale Caller ID". For a comparison of machine learning algorithms in use, see: Mellinger DK, et al. 2007. An overview of fixed passive acoustic observation methods for cetaceans. Oceanography 20:36–45. Mellinger DK, et al. 2007. Seasonal occurrence of North Atlantic right whale (Eubalaena glacialis) vocalizations at two sites on the Scotian Shelf. Mar. Mamm. Sci. 23, 856–867.